… laugh at the little things. Last week, I started feeling pretty awful. Lymph nodes began flaring again, chest inflammation, irritability… blah, blah, blah, so I closed down my Etsy shop. Just in time, as luck would have it! Leila had also been sick with a virus for over a week. She was coughing non-stop, but it was productive and her doctor listened to her chest several times and said she had normal breathing sounds, so not to worry. She began vomiting mucous, but my doctor said again, not to worry, she would be fine. After 5 days of her vomiting mucous and gasping for air, I had had enough and asked Michael to take her to urgent care. I would stay behind with the little ones because they had their own congestion issues and I didn’t want the petri dish of a hospital make matters worse. At urgent care they took xrays and noted something, but they weren’t quite sure what it was, they recommended a ct scan, which would have to be ordered by her doctor the next day, started her on antibiotics, and sent her home. She had coughing spells and difficulty breathing throughout the night. After we sent Jax off to school in the morning, I told Mike not to wait for her doctor’s office to open and to just take her to the ER, where they could run a ct scan. I paced with worry while the little ones slept and when Mike called me a few hours later to ask me if she could have been exposed to TB and I could hear her in a fit to catch her breath in the background, I had had enough! Still without a license and not wanting to expose my neighbors’ kids to whatever my children had, I asked a dear friend to drive me and the kids to the ER. Like a scene out of Terms of Endearment, I hovered over her, fussed over her condition at the nursing desk, got her a warm blanket, tissues, more meds, begged for the doctor to come talk to me immediately… I was a mess. They performed new xrays and though there was a discrepancy, they were sure that her lungs were ok. They ran a TB test and started her on a stronger antibiotic. The nursing staff stood by my side and comforted me, while they explained for nearly an hour why she was doing much better than she sounded. They were so very kind to me. We went home and 2 days later, I decided to get out of the house for a bit and drove everyone to the local pharmacy to get some more meds for our at home infirmary. And guess what??? While at the pharmacy (obviously, because it was the only place we had been within 48 hours), Tess picked up the dreaded stomach bug. Oy vey! I stayed by her side and woke up with her every 15-30 minutes and washed and rewashed blankets and sheets and pjs. While doing one load of laundry, I asked Mike if he could watch Tess as I had just put her in the bathtub. She had an “incident” in the bathtub, which Mike tried to swipe down the drain. The “incident” resulted in him contracting the stomach bug, himself! Woo hoo! And within 24 hours, I came down with it, as well. As the 3 of us laid in a king sized bed, taking turns in the bathroom and changing runny diapers, I heard faint giggles coming from Tess. In the quiet of the night, I listened as Mike snored over and over again and with each bear like growl a tiny toddler laugh followed. Though I had just hovered over the commode and I was destined to return in nearly 30 minutes, and I felt like a bus had hit me, AND had one of the most stressful weeks, since Phoebe’s surgeries… I let out a giggle too each time… after Tess would giggle… after Mike would snore. It’s the little things, or the little people, rather that just make life spectacular, even when it’s rotten. Sandy came and went. The power merely flickered, once I think. The mailman survived… and so did the mail. Damn it! Our roof leaked in a couple of spots, but nothing that required a bucket. However, that didn’t stop my husband from hopping on top of the roof a couple of hours before the eye of Sandy made landfall. No… he had to check it out… and… found nothing. I over prepared, as I sent my husband on several shopping excursions during the days prior to the storm for massive amounts of groceries, mostly perishable (because why would an oncoming hurricane suddenly help me make an intelligent decision) and then baked a huge vegetarian lasagna the morning of Sandy for me to nibble on during our week without power that never happened. Half of it is now awaiting the trash can. Tess fell asleep promptly after taking this photo and stayed asleep for our entire trip around the neighborhood. Jax (in his black morphsuit. 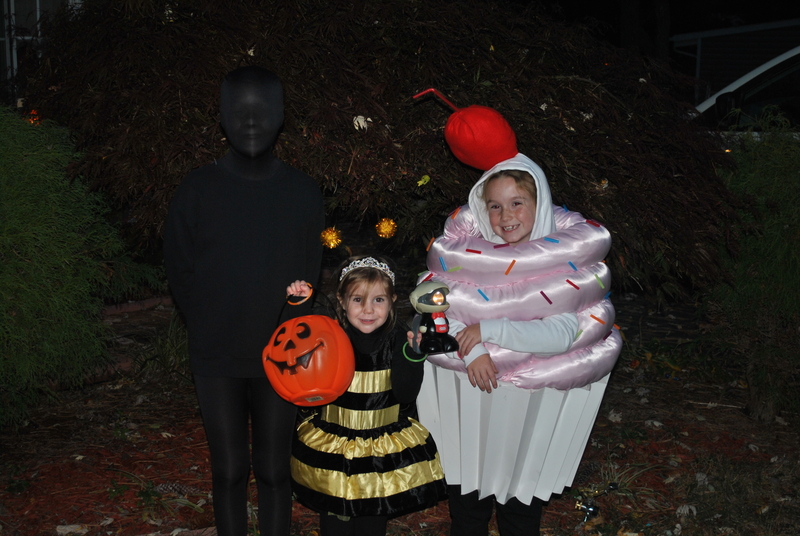 yes, he IS in the photo), Phoebe (the princess bumblebee), and Leila in her cupcake (polite as she tried to be (since, I made her costume), Leila had to strip off her cupcake and be a “cherry head” for the last half of her trick or treating adventure because her costume got so heavy. Tyson and Deon from next door, Brandon and Lucy from down the street, Leila’s friends from school (Samantha and Kelly) and a few of their neighbors, and then Tyson had a couple of his friends from school join in on the fun, too! All-in-all I think it was a group of 15 kids, 8 parents, and 1 dog walking chasing each other door to door this year and it was AWESOME!!! Lots of mysteries were solved along the way including… what’s that??? marijuana??? Yes, that is indeed a drug house., Huh, I guess there isn’t a dead person in that house after all. (oddly disappointing), and our missing new friend is alive and well at the end of the street dressed as a witch… YAY! Jaxon came home 30 minutes after getting to school and promptly vomiting outside of the gym. He then laid in the bathroom floor shivering with a fever of 102. Poor guy! My hands are tortured from all of the washing and sanitizer, but I’m praying that no one else will catch it. Advil has barely dented his high fever for the past 2 days. In an effort to get crap lovely things that you should buy moving out of my “sewing corner”, I put several onesies for sale on Etsy. I don’t imagine that they will sell, but they are on there, so that is progress. Maybe I will make each onesie a pair of matching boots so they will sell and I can be done with them. 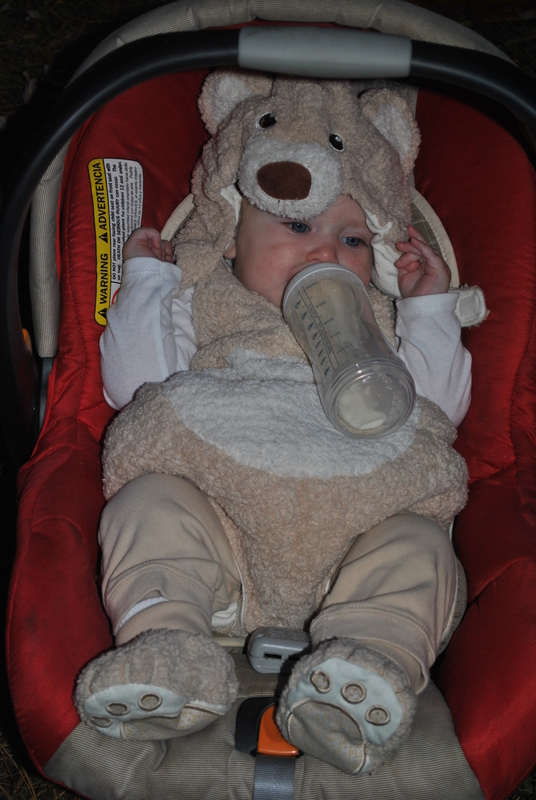 (onesies turned out to be much more of a project than they are worth. fortunately, I only bought like, 20 of them to complete.) They are all newborn size (which is the problem with selling them. You pretty much have to be shopping for an up and coming baby shower to consider purchasing them.) So if you happen to be reading this and know someone who is knocked up, you should buy one of my super awesome onesies. I’ll give you a 50% off coupon code if you comment on this post! Oh yeah, Tess started crawling this week! Can you believe it?! Everything this year has been such a blur! I hate blinking any more. Yep, so she’s crawling, which is why I’m deep cleaning the house. Not the greatest time of year to do, as a yard sale mid-hurricane/odd-noreaster-type-storm/blizzard is out of the question. If you are interested feel free to stop by my house and point at random things that you’d like to have and I can guarantee you’d probably end up going home with it.